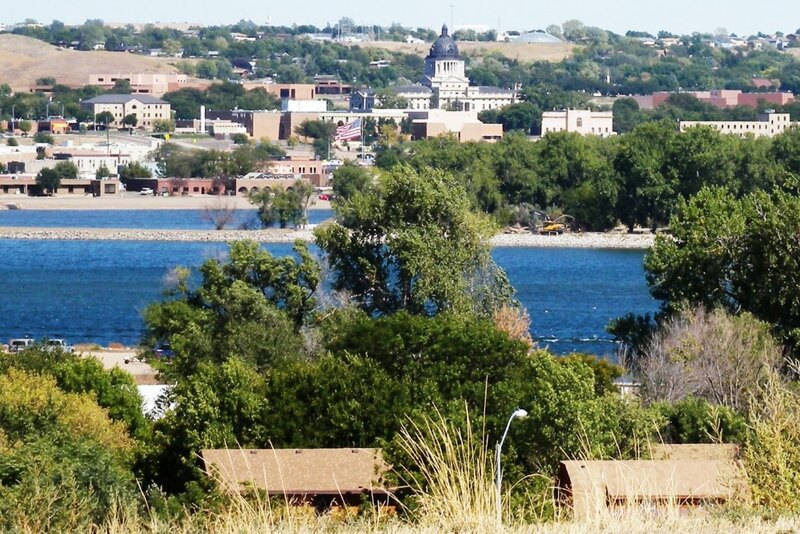 South Dakota became a state November 2, 1889, the 40th state admitted to the Union. Pierre (pronounced PEER, the only state capital with one syllable) is in the geographic center of the state. It is surrounded by lush grasslands, and its prosperity came from the cattlemen to the west and the farmers to the east. The capitol is built of limestone and local boulder granite. Its dome rises to a height of 159 feet and is covered with 40,000 pounds of copper. Capitol Complex has 16 buildings surrounded by 8,000 flowers. Flaming Fountain, an artesian well on the shore of Capitol Lake, is so named because it is so rich in sulphur the waters can be lit. The Cultural Heritage Center, built low into the ground like the sod houses of the prairies, has scenes of Pioneer and Native American life, as well as mining and historic exhibits. The Discovery Center has hands-on science and technology exhibits and aquariums with native fish. Oahe Dam and Reservoir are part of the Missouri River Basin Project. Badlands National Park is to the southwest. The friendly small-town way of life, the kindness shown, the warm brown hills and sparkling river waters, the fishing and the hunting and the love of life, the pride in the capitol, kept open every day for all to see, the homecoming parade. Mountains near: Black Hills. Harney Peak in the southwest corner of the state is the highest point in South Dakota at 7,242 feet.